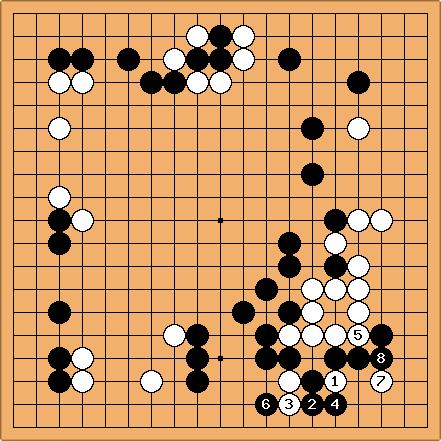 As a multidigit kyu player, I can see that my biggest weakness is that people walk straight through what I thought were supposed to be my boundaries. How can I tell whether my borders are safe or not? Would somebody document some common patterns of what looks secure but isn't or vice versa? How about a range of puzzles about plugging or exploiting leaks? Or have I misunderstood something more basic? Tapir: The biggest misconception might be, that you see the stones you put on the board as border of more or less safe territory. At least this is what i did during the first time. This takes away flexibility and is somehow a mistake. It would be helpful if you can post some examples from your games to discuss. Tapir: The main problem here is shape. But let us make a short tour, starting with defect in a wall. Such a defect may be exploited by peeping at it, which makes a forcing move. This may not be such a good idea, if the defect is a valid cutting point. If there is no solid wall at all, then we have several basic shapes with different properties. The two-space extension on the third line, which cannot be cut, but the three-space extension leaves a obvious invasion point in the middle. There is the one-point jump which can be cutted, but which is usually not advisable, the knight's move has a cutting point as well, but the lion shape really can't be cut (unless directly adjacent to enemy stones). The bamboo joint makes a sure connection. If there is some defect, beginners may in order to defend find themselves making things worse by squeezing out the toothpaste. 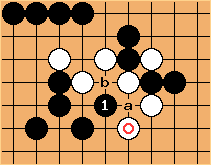 Tapir: If in this position white manages to break through the black stones, you should not wonder, and it is not a tactical mistake by black to be cut here, but a strategical misconception to assume this thin stone arrangement as a boarder of territory. So, there are several points were white can break through. 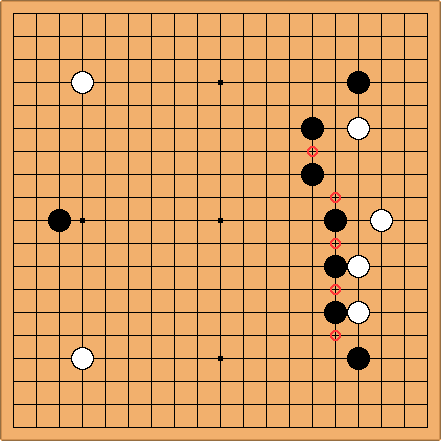 ...but even if black has stones on all the circled points he surely has a big wall with magnificient thickness / influence but not territory yet! The right way to use it is by attacking, not by trying to surround territory in the center as proverb this advice sounds Don't use thickness to make territory. Because white can approach the center from three sides. White is missing two stones... did she pass twice? I never said anything about territory though. If white just lands on the left hand side of my 'border' that's a differnt thing. I can see that it's not rock solid yet, but I kinda feel that I made a statement that some kind of border of mine was supposed to develop around there. It doesn't matter whether or not that was good tactics/strategy because its just an example. I often get the same problem in more developed situations where somebody finds a leak in what is obviously supposed to be a territorial border and walks all over half my territory before I can put the fire out. So I still want to know how to spot those leaks earlier or limit the damage if I'm too late. Supposing I had got a wall on the other side of my example and I did want a territory there. How do I defend that line? Tapir: In my opinion, you can be quite happy with the result in the game. The breakthrough is very limited and white ends overconcentrated (e.g. spending 8 stones capturing 1 stone and thus making 2 points). This is a strategy which still works well for me (~4k): offering some sacrifice to make the opponent slow, heavy and overconcentrated by adding lots of stones to capture. - In the situation you describe mutual damage might be the best way to limit the net damage suffered. 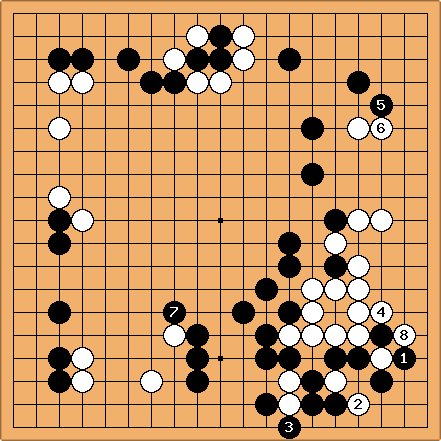 The marked stone simply is a mistake, allowing Black to cut by since White can't defend both a and b here. The marked stone should have been at a.